AT&S gives you the option to include additional instructions for your students. Please note that ‘instructions’ in this setting are not the same thing as your actual assignment or body of your exam questions, where you explain the actual assignment. The instructions of an assignment or a test is information that you want students to see before they access your actual assessment. It is what they will see in the “Begin” screen of the assignment, test, or survey. Examples of instructions that you may include are: This is an open book exam. Or, for this assignment, you may work with a classmate, etc. If you have 1-question assessments, there will be no need for instructions. Just leave the instructions areas blank. In “Assignments,” you will probably have no need to add any instructions at all, as you will probably tell students what to do in the actual assignment. First, add an assessment. 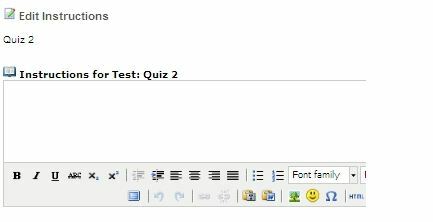 From the Assessments view, click on Add and then choose an assessment type. Second, give your assessment a title. This can be modified later, if needed. Next, add instructions by clicking on the “Edit Instructions” link, located just below the title field. From “Edit Instructions,” you get one convenient screen to add instructions for the assessment and its parts. Instructions are optional. You may add and revise the instructions in your assessments at any time. Even if your assessments are open to students, you can still return to them to make revisions, as necessary. 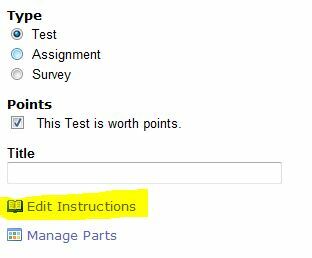 If your assessment has several parts, click on Manage Parts to add instructions specific to each section / part.